Das Akkreditierungsverfahren Gefässzentrum USGG ist eröffnet. Ab sofort kann die Briefvorlage für die offizielle Kandidatur Gefässzentrum USGG auf der Weseite USGG oder einer der Untergesellschaften heruntergeladen werden. Servier, with the European Society for Microcirculation (ESM), is offering a research award: the Servier Award in Microcirculation. The next prize will be awarded at the ESM Congress in Pisa (Italy). A € 4000 grant is offered every 2 years for an outstanding clinical or basic research publication in the fields of microcirculation and vascular biology research, in the experimental or the clinical environment. Applications should be submitted no later than February 28, 2015, and sent to the ESM general secretary: Akos Koller (akos.koller@aok.pte.hu). The University Medical Center (CMU) is the research building of the Medical Faculty of the University of Geneva. The laboratory of Prof Beat Imhof in the Department of Pathology and Immunology is a dynamic research team working on Vascular Biology, Cancer and Leukocyte migration. We are looking for a creative and motivated scientist with expertise in tumor biology, angiogenesis or a related discipline to conduct research in mouse tumor models and vascular research with human endothelium in vitro. In particular research is directed towards testing the therapeutic effects on tumor angiogenesis and lymph-angiogenesis of novel anti-oxidant drugs developed by a Geneva based start-up company (Genkyotex). The successful candidate will work in a unique collaborative project between Geneva, the University of Fribourg (Prof. Curzio Ruegg) and the company Genkyotex. The project is funded by the CTI (Swiss Innovation an Technology Commission). The intention of this setting is to deliver novel therapeutic avenues and understanding the molecular mechanisms for cancer treatment. Independently design and conduct experiments related to tumor angiogenesis and lymphangiogenesis (in vivo and ex-vivo experiments, histology analysis, in vitro proliferation, migration assays, signaling). Conduct data analysis and prepare data for presentation in peer-reviewed journals and at professional meetings. Prepare manuscripts for submission to peer-reviewed journals. Provide funding agencies with progress reports as required. Present oral presentations to professional and lay audiences regarding the research being conducted in the laboratory. PhD, MD or equivalent degree in vascular biology, tumor biology or a related life science discipline. No more than 2-3 years of post-doc experience. Proven ability to advance scientific knowledge in a comprehensive and rigorous way, as documented by relevant peer-reviewed publications. The position is intended for two years, starting from September 2015. Guest editors Dr. Anna Csiszar and Dr. Akos Koller, along with the editorial team of AJP-Heart and Circulatory Physiology, invite submission of original research articles related to the pathophysiological role of microvessels in the development of a wide range of chronic diseases and disorders. The length of the microvessels in an adult male may be as long as 100,000 km. Recent research using a variety of experimental approaches has provided novel insights into common cellular and molecular pathways by which structural and functional impairment of this immense microcirculatory network contributes to the pathogenesis of various age-related diseases and disorders of the heart, brain, eye, kidney and skeletal muscle. We welcome submission of studies using a variety of experimental approaches, including in vivo studies, investigations using isolated microvascular preparations and cultured microvascular endothelial and smooth muscle cells and pericytes. We are especially interested in manuscripts addressing the role of microvascular mechanisms in impaired delivery of oxygen and nutrients, dysregulation of tissue perfusion and blood pressure, inflammation and impaired transport and barrier function. We also welcome manuscripts focusing on mechanisms and consequences of microvascular endothelial dysfunction, altered secretory function of microvascular cells and impaired regulation of arteriolar vasomotor function and addressing the relationship between microvascular health (including autoregulation of blood flow, capillary density, blood brain barrier integrity, neurovascular coupling mechanisms) and the pathogenesis of diseases of the central nervous system (including neurodegenerative diseases, stroke and vascular cognitive impairment). Authors are also encouraged to submit manuscripts focusing on the pathogenic roles of lymphatic microvessels. All manuscripts accepted from this Call for Papers will be included in a unique online article collection to further highlight the importance of this topic. The article collection will also include specially commissioned Review articles. During the online submission process, under the "Keywords & Special Sections" tab, please use the "Category" drop-down menu and select "Small Vessels - Big Problems". Manuscripts will undergo normal peer review as they are received. Accepted manuscripts will be published online as they are received. Articles published from this Call for Papers will be highlighted with a special "Call for Papers" banner on the article PDF, as well as included in the "Small Vessels - Big Problems" online article collection at time of publication. Manuscripts must be submitted by January 15, 2016 to be eligible for inclusion in this Call for Papers. If you have questions please contact Kara Hansell Keehan, Executive Editor, via email at khkeehan@verizon.net. 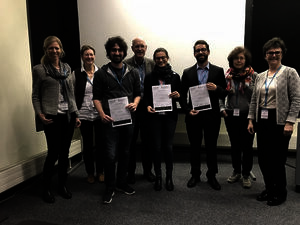 “Modelling the multi-step migration of human T cells across the human blood-brain barrier under physiological flow in vitro: Introduction of a novel nanomembrane based flow chamber system"
The SSMVR board together with the winners of the poster prizes From left to right: Professor Cornelia Halin Winter, Dr. Ruth Lyck, Dr. Adrien Mossu, Professor Beat Imhof, MSc. Martina Vranova, Dr. Florent Allagnat, Professor Tajana Petrova, Professor Britta Engelhardt. We are very thankful for the perfect organization by Cornelia! On November 2, 2017, the SSMVR general assembly dismissed Professor Beat Imhof from his board membership. We are deeply grateful for his valuable support and contribution and wish him all the best for the new chapter in his life! Beat Imhof will be a honorary member of the SSMVR in the future. In turn, new board members have been elected: We welcome Professor Markus Affolter, Professor Brenda Kwak and Dr. Amelie Sabine! Amelie takes over the new position of a junior representative in the SSMVR board.